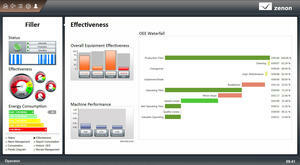 Optimize overall equipment effectiveness (OEE) with zenon. 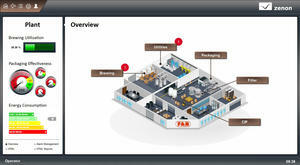 In March 2014 COPA-DATA brought zenon 7.11, a new update of its industrial automation software, to the market. The new product version comes with a variety of innovative functionalities, providing numerous benefits, particularly tailored to the Food & Beverage industry. The zenon Product Family is already a well-established system in the Food & Beverage industry, providing comprehensive solutions in terms of human-machine interface, data acquisition, process control, supervision, analysis and reporting. zenon plays a central role in applications such as batch control, production line management, certified energy data management, building and utilities automation. The experience gained from these wide-ranging projects in manufacturing plants all over the world, combined with the results from Research & Development and the creativity of COPA-DATA´s software specialists, offer the basis for continuous development. Due to the ergonomic engineering and design approach, zenon 7.11 offers customized benefits for individual user groups. One advantage is that members of production teams, from the operator to the manager, are able to fulfil their tasks with less effort and at a high performance level. The zenon development environment also addresses automation and IT specialists and their demand for connectivity, diverse functionalities and flexibility. Many previous out-of-the box modules have been further expanded in zenon 7.11, making state-of-the-art technologies available to anybody who chooses to implement an industrial application, be it for process operation, improved OEE or energy consumption optimization. The need for extensive connectivity to production equipment and manufacturing systems was expanded through new communication drivers. The Batch Control module of zenon was also developed further, resulting in a reduction of engineering time in the PLC, by supporting various control strategies of the production equipment. 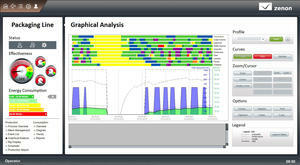 Process engineers now have increased control of the different versions of the batch recipe templates. Improved ergonomics in zenon 7.11 is also seen in the way users can easily interact with production processes and quickly benefit from the abundance of available information. Process visualization, trend curves, alarm and event lists, and reports are continuously available in the clear context of production area, equipment, time and relevant production data, such as batch, shift, article etc. The user is also supported with top-down approaches offering more flexibility, from global overview to complex analysis, using dynamically-filtered details within comprehensive faceplates. In order to reduce integration time and improve the graphical quality of the entire application, innovative Food & Beverage specific symbols where designed and made available to automation specialists. Furthermore, the support for mobile applications based on zenon was enhanced, offering increased security and performance. The zenon Everywhere Server is also open to project engineers developing their own apps or for integration in web-based solutions established around zenon. 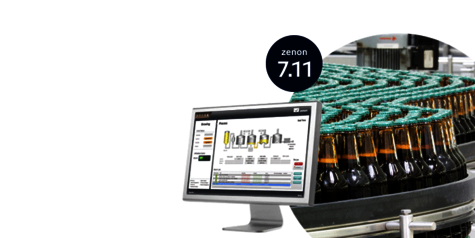 zenon 7.11 brings improved ergonomics in project configuration and Runtime, providing Food & Beverage manufacturers with a sophisticated and reliable industrial automation platform for continuous improvement and a rapid return on investment.